The viscid violet cort mushroom grows in woods with hardwood trees, especially oaks and beeches. These slimy purple mushrooms are 1-3 inches tall with caps that can be 1-3 inches wide. Viscid violet corts have gills under the caps. With the approach of fall and the help of a little rain, mushroom season is beginning to bring its colors and curiosities to Westborough’s woods. Take the two wild mushrooms in our photos – a purple one and a shaggy one. They’re certainly not good to eat (although not poisonous), but they’re so strange-looking that they’re great fun to find along a path or trail. The name of the purple mushroom isn’t too surprising – viscid violet cort (Cortinarius iodes). That name pretty much describes the mushroom’s color and wet, slippery appearance. You might even call it slimy. The bright purple color can make it easy to spot among the dead leaves in the woods. Based on experience with supermarket mushrooms, we usually think of mushrooms as white, tan, or brown, but wild mushrooms in the woods also seem to come in all the colors of the rainbow. Look around as fall progresses and you might find red, orange, yellow, green, and blue mushrooms, in addition to violet ones. A curiosity: The old man of the woods, also called pine cone mushroom, comes up in mixed forests with both hardwoods, such as oaks, and pines. It grows up to 5 inches tall, with a cap 1-6 inches wide, and has pores, rather than gills, on the underside of the cap. 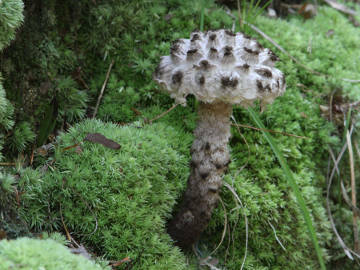 This mushroom can last in the woods for weeks or months in a dried-out form. The viscid violet cort and the old man of the woods both grow on the ground, not on living trees or dead wood such as logs and stumps. You might spot them at the side of a trail as you walk along with your eyes on the ground ahead of you. These two mushrooms both tend to grow in woods with oaks, which are common in much of Westborough’s woods. Keep an eye out for the viscid violet cort in hardwood forests with oak and beech. Look for the old man of the woods in “mixed” woods, which include pines or spruces in addition to hardwoods like oak. We also think of mushrooms as having gills on the underside of the cap, like typical store-bought mushrooms do, but not all mushrooms have gills. 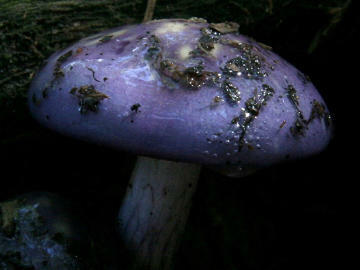 In the case of the two mushrooms in the photos, the viscid violet cort has gills, but the old man of the woods does not. Instead, the underside of its cap is relatively smooth, with tiny holes or pores. You can check to see whether a mushroom has gills or pores by looking, or by gently feeling the underside of the cap. Both the gills and the pores exist to produce and release spores that will spread the mushrooms, or more exactly, the fungus that produces the mushrooms. In the case of the viscid violet cort and the old man of the woods, the fungi live year-round in the ground, in the form of lots of thread-like strands that you might or might not be able to see. The fungi produce the mushrooms when the season and conditions are right for reproduction. The underground portions of both these fungi (and many others) form a mutually beneficial relationship with the roots of plants, such as the oaks and other trees they usually grow near. The fungus strands grow around the outside of the roots and even grow in-between the plant cells that make up the roots. Does this harm the roots? No, on the contrary, the many minute strands of fungus help the plant roots absorb water and minerals from the soil. In return, the plants provide the fungus with some of the sugar made through photosynthesis from the sun’s energy, carbon dioxide, and water. These helpful associations between fungi and plant roots are known as mycorrhizae and are key to the health of forests and many crops. You may even have purchased a bag of potting or garden soil that includes ingredients for mycorrhizae. If you’d like to learn more about the mushrooms in our woods, don’t miss WCLT’s upcoming talk and walk by Larry Millman, mycologist and author of Fascinating Fungi of New England, a new guidebook devoted exclusively to New England fungi, on Sunday, Sept. 30, 1-4 p.m., at the Headwaters Conservation Area (meet at Mill Pond School parking lot). Space is limited to 18, so if you are interested, please send an email to: events@westboroughlandtrust.org.